After the New Gate, Odos Plastira continues at Odos Pediada around the walls and into Platia Eleftherias (Freedom Square). Three vaulted arches of the Venetian aqueduct used to stand here. Traces of this aqueduct can still be seen southwest of Iraklion (See Fortetsa). Water passed through it and on to the Morosini Fountain . 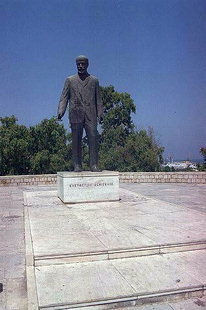 At the northern end of the park is a statue of Eleftherios Venizelos (1864 - 1936), the highly-revered Cretan politician. 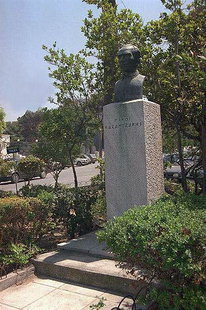 Also in the square there is a bust of the Cretan author, Nikos Kazantzakis. Opposite the statue is the Kipos ( Public Gardens). 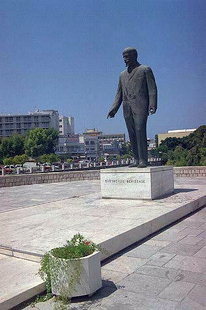 Just at the entrance of the square, on the left, by the Olympic Airlines offices, is Odos Othonos. Continue to Odos Averof and the Platia Kornarou at the end of Odos 1866.